This recipe was, I think, from Sainsbury’s magazine about eleven years ago. I think it was Nigel Slater – apologies if that’s wrong but it’s impossible to remember accurately and who would think I’d be sharing it on a blog a decade plus later? I do however, remember what attracted me to the recipe which is (like so many recipes that attract me, I’m so shallow), the photo accompanying it had a pile of these stacked up. They just looked so good. And they are. I have been known to make a present of these biscuits with a cheese humidor, and some nice cheeses, to a host(ess) for the weekend. Sift the oatmeal, flour, baking powder and salt if using, into a large bowl. Tip any bran that’s left over in the sieve, into the bowl too. Add the butter and the sugar and rub lightly until it resembles breadcrumbs. You can – I do – do this in the food processor using the pulse function but don’t over do it. Pour in the milk and continue to mix until it’s all moistened. A few more pulses in the processor should do it, but don’t wait for it to come together as if it does you will have overworked it. If you’re unsure, open up the food processor and try to squeeze some of the mixture together – if it holds together fairly easily it’s ready. Draw it together into a ball/abstract shape and cover. Rest for ten minutes. There is no need to do this in the fridge but if you want to make the pastry in advance, put it in the fridge for a day or two. You will need to take the chill of it (room temperature for a few hours) before you start working with it however. When you’re ready to make the biscuits, you can flour your table top but I very lightly oil a large chopping board. You do need to roll out the pastry (I hate this bit). When it’s about 5mm thick you can start cutting into whatever shape you want. Mine are approx 3″ square. Don’t make them too thin – they’re more liable to break and burn. You don’t want to overwork the pastry either – don’t make it any work harder than it has to – so I roll these out in two batches. The mixture makes about 16 of them. 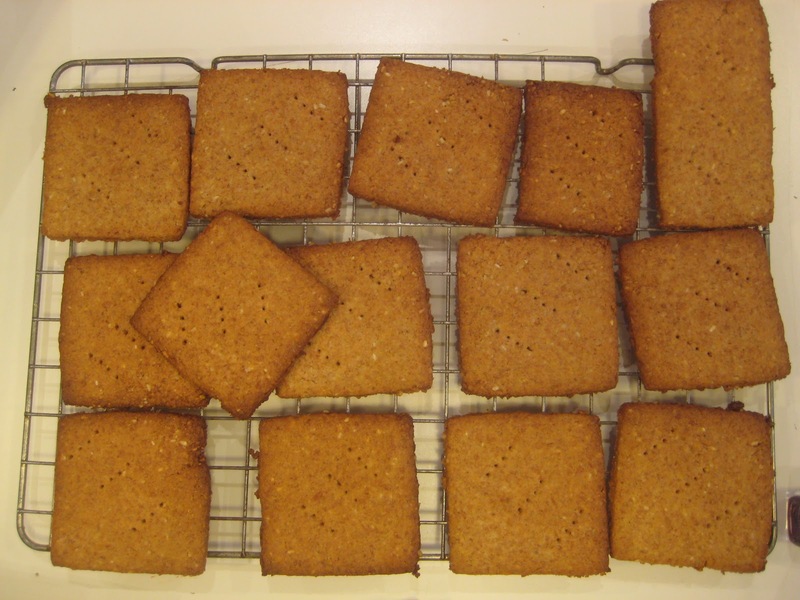 Lift them onto a baking tray lined with baking parchment (it’s really worth using baking parchment, trust me). You may need to use a very fine bladed spatula to separate them from the surface you’ve rolled them on. Place on the tray. You can place the fairly close together – but not touching obviously. They do rise, but minutely, so you don’t need to space them really far apart. Get a fork and prick each biscuit three times. I find this unbelievably satisfying. Cook for 10-12 minutes. My oven is very hot so it only takes 10 minutes. Leave on the tray for five minutes, then gently lift off onto a cooling rack. I’ve left them too long on the baking tray (not using parchment) and they’ve stuck horrendously. So learn from my mistakes! You can even eat these on their own. They remind me of a really good digestive biscuit. Very nice with cheese and some left over from Christmas cranberry sauce. This entry was posted in Biscuits, Presents and tagged cheese, oatmeal biscuits on January 20, 2011 by Annalisa Barbieri. My friend Karen is a professional personal stylist/shopper, which is a good sort of friend to have. She is completely fantastic: she makes me try things on, and some of the best finds I’ve made in recent years have been due to her. Despite me being able to style anyone else, I hate clothes shopping for myself. Sure it was fine and fun when I was a teenager and never ventured over 40 kilos. But it’s not so fun these days. Anyway, Karen is always trying to get me into heels. I do wear heels, for parties. I wear high heels for parties. Really high heels. Heels so high I can’t actually walk in them and have to stand permanently in one spot so that people have to come to me and then I have to text my partner to come get me and take me to the nibbles. 99% of the time, however I wear flat, comfortable shoes. Shoes I can run in if I have to. Shoes that I can walk miles and miles in. Comfortable shoes. But stylish ones. I’m not into Hotter shoes yet. b) I don’t/can’t wear heels, any kind of heels, during the day and still feel ‘safe’. They make me feel vulnerable. c) I could buy the heeled ‘every day’ shoes she thinks I might be able to wear, but I will never wear them. Even though what she says makes perfect sense and I should be like a normal girl and be able to wear low-heels every day. But I can’t. And Karen accepts that now. This winter I told her I needed boots. What I wanted were some biker type boots, but that fitted better than biker type boots that are actually pretty badly fitting and you can’t, not really, walk huge distances in. Also biker boots…not overly smart. I wanted something to ‘winter up’ my DVF dresses and smarter things. I wanted them to be really fitted, up to the knee. I wanted them to be fairly delicate, but not stupidly so. They had to have a rubber sole. Prada was the obvious place to look but the assistants were so rude to me (I will be telling Miuccia) that I left. Also, truth be told, even with the discount, even taking price per wear into account, I just didn’t want to spend that much money on a pair of boots. Karen took me into Camper. I’ve never been into Camper. See, even though I like comfy shoes, Camper, to me, says “hippy shoes” which I don’t do. I tried on these boots. So they weren’t bikery at all. But never have I tried something on in a shop and had so many people (three) come up to me saying “they look really good” and then ask to try them on themselves. One of the things I find hard about knee boots is that they are often too big around the calf for me. These fit really snugly. They have a tiny, rubber, wedge heel. I can walk in them all day. I love them. They looked really good on her but they weren’t ‘smart’ enough for what I wanted. They’re Gore-Tex and really rugged. But I didn’t buy them. As soon as I got home to Suffolk and I started cycling home through the dark wintery streets, I realised that I really would use the Ecco boots far more than the Camper boots currently in my bike carrier. I couldn’t stop thinking about them because for every day, all I had were my walking boots – great for walking but huge, clumpy and take a good five mins to lace up. Or my Kiwi sheepskin boots which I can’t walk long distances in. As the cold set in, I realised I really really needed two pairs of boots, so I bought the Ecco ones. I really, really recommend both boots. They do very different things. The Camper boots are great to wear with a smart skirt, but when you still need practicalility and warmth. The Ecco boots are just brilliant work-horse boots. They look really smart but are they wouldn’t look right if you were trying to ‘dress up’ at all. All through the snow, the Ecco boots kept me warm, comfortable and safe – they are amazingly grippy (the Camper boots aren’t). Both boots I can walk in all day. This entry was posted in Consumer on January 10, 2011 by Annalisa Barbieri.